Following on from A Spot of Tech Geekery: Tricky Technology/Web/Online Terms Made Easy, Part 1 (A to H) today’s article is going to walk you gently (in normal speak) through another 11 tech geekery terms. We’re covering everything from landing pages through to web servers and by the end of the article, you’ll be a whole lot more clued up about your website/technology/online jargon. So let’s make a start, shall we? LANDING PAGE – as the title suggests, this is a page where your visitor first lands on your website – usually your homepage or a welcome page. You may also know it as a sales page, too. Let’s say, for example, you’re trying to encourage visitors to sign-up for a new online programme you’ve just launched. To get the information in front of potential buyers, you will direct them to a specific landing page (sales page) and keep your fingers crossed that they’ll click the ‘buy now’ button. METADATA – usually included in web pages, metadata describes other data/information. Some metadata in a text document might tell you who the author is, when the document was created, a brief overview of the content, and its length. Much of the metadata is formed by metatags (see below) and takes the form of descriptions and keywords which are used to describe the content of a web page. It’s pretty important stuff because this is (partly) what the search engines use when deciding where to place your website in their search rankings and indexing. METATAGS – these are special tags which store information about your web page but won’t be displayed to any of your web visitors. Tags can be keywords which are relevant to the content on the page (and again, are used by search engines to index web pages and websites). This permalink (permanent link) is your permanent address for this blog post and it’s the link you’ll use when you’re sharing your blog with your social media followers/newsletter subscribers. PLUG-IN – fab little bits of code that give extra oomph to your website (without you having to fiddle around with coding or setting up new pages on your website). I love WordPress plug-ins and you can get them for so many different things. 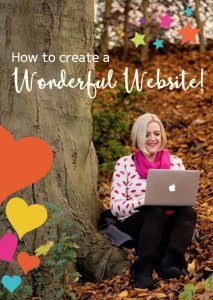 My lovely client, Emma Holmes, Founder of Rebels and Rockstars, has written a fab blog about this too: http://www.rebelsandrockstars.com/10-plugins-wordpress-coaching-website/. TEMPLATE – when a website isn’t custom built, a pre-designed template can be used instead. This provides a consistent design throughout a website and allows the user to add their own text and images in a much easier way. URL – a ‘Uniform Resource Locator’ is a website’s address. So when anyone asks for your URL, they are simply requesting your website address. USABILITY – similar to the points mentioned above in ‘Navigation’. This term refers to how easy or difficult it is for your web visitor to use your site. The trick is to keep it as simple and user-friendly as possible so users don’t get a headache trying to work out where to find your testimonials, for example, and bounce away instead. So there you have it, 22 techie terms broken down into 2 articles (to prevent any migraines if you read through them in a single sitting!) and explained in easy language. If you still aren’t clear on some of these terms, then please don’t hesitate to ask me about them. Come along and say ‘hi’ and let me know which terms you found the most helpful.